Welcome to Marwen is a strange cinematic experience. It is a type of strange that comes across to the viewer almost as discomforting as an unwelcome personal confession might. Directed by the whiz of special effects, Robert Zemeckis, he collaborates with Universal Pictures to tell the inspirationally “true story” of Mark Hogancamp, a man who creates a fantastical town after suffering a devastating hate crime assault, one that throughout the film’s duration helps him fulfill the heroic role through his artistic doll creations, even as the viewer becomes incessantly let down by the potential of both Hogancamp’s reality and Marwen’s ambition. 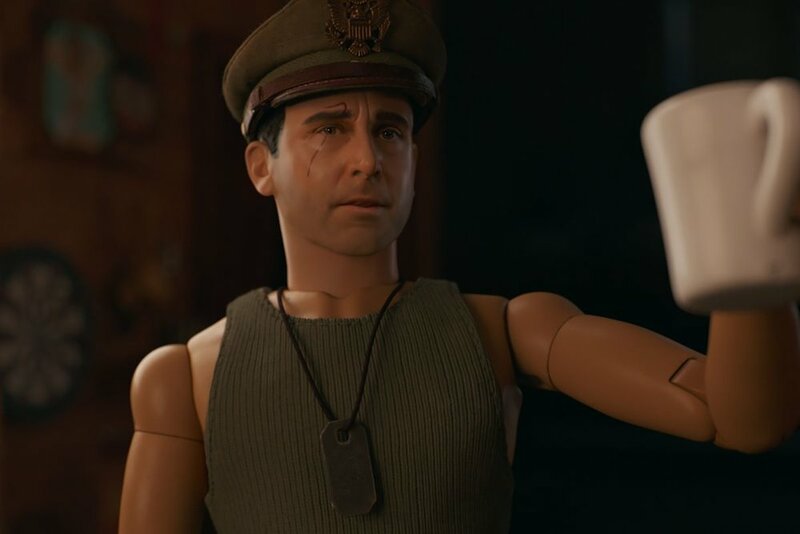 Released on Dec. 21, Welcome to Marwen’s (PG-13) lack of media presence may have contributed to its failed box office mark, as the film bottomed out at $2.3M in 1,911 theaters. According to Box Office Mojo, the domestic total of Marwen’s earnings as of Dec. 30 were a mere $7M, landing it no. 123 on the list of Worst Opening Weekend. Drawing its inspiration from the 2010 documentary Marwencol, Welcome to Marwen follows the life of Mark (Steve Carell), who is a Navy veteran and artist that falls victim to a brutal beating by five men outside of a local bar, an incident that leaves him close to death and devoid of memories. Carrell is joined by a solid cast, although mostly seen and drawn out in Barbie, Ken, and G.I. Joe doll-like representations. Leslie Mann, Diane Kruger, Merritt Wever, Janelle Monáe and Eliza Gonzalez each play impressing roles. In the aftermath of Hogancamp’s beating, he creates a meticulously-detailed World War II miniature village on his property in 1944 Belgium. Using the dolls to reclaim his lost memory, Mark reflects on his psychological torment and ongoing recovery, accompanied by heavily armed women that serve as actualized versions of those he knows in real life. From the get go, Marwen’s potential is undeniable. It comes across as a relatable story about being different, recovering from trauma and the effects of repressed memories. Unfortunately, these driving points are lost between the disconnectedness of the two realities that are both uneven and jarring. As new characters and threads are introduced without much context, others are easily left behind alongside the viewer. The film’s two most memorable turns of events happen at the arrival of Hogancamp’s new neighbor (Leslie Mann) who he develops unexpected feelings for, in addition to facing his attackers in a court hearing, the antagonists he’s been averse to face all along. Other than these, the audience watches as a tedious and rather predictable plot transpires. At its basest level, the viewer is left with state-of-the-art animation and special effects that ultimately take away from the heartwarming drama that Zemeckis might have pinpointed. Perhaps it have been better to do just that.